After Monday’s and Tuesday’s frightening downdrafts, many investors are panicking. Despite the recent rally, Shah told Fox Business viewers that we’re not out of the woods yet. Find out how fragile he thinks the market is – and what you need to do to protect yourself. Is Now the Time to “Lighten Up” on Stocks? “It’s time to protect ourselves,” Shah warned Varney & Co. viewers today. With no support or good news for the stock market on the horizon, Shah believes it might be time to batten down the hatches. On his latest sit-down with Stuart Varney on FOX Business, Shah issues a chilling prediction about the global market that you’re not going to want to miss. To find out how much the market stands to lose, just watch the video below. Peer-to-peer lending, or P2P as it’s known, is a juggernaut financial-services Disruptor. But thanks to its supercharged growth, P2P lending has attracted the attention of regulators and other financial-market overseers. They’re scrutinizing this new form of lending from multiple angles – fearing it may be too disruptive for its own good. The U.S. Treasury Department, the Consumer Financial Protection Bureau, financial services regulators, bank and finance company lobbyists and, most recently, the U.S. Court of Appeals for the Second Circuit are weighing in on P2P lending. For borrowers in love with lending platforms that give them access to money that would otherwise be hard – even impossible – to get. For private lenders who loan money to borrowers at above-average rates. And for the owners of sites that match lenders and borrowers for a fee, including investors in publicly traded ventures like LendingClub Corp. (NYSE: LC). There’s even more at stake for the stock market and the economic health of the country. The issues aren’t complicated, but tackling them will be. As we’ve said before, P2P lending is one of the biggest new developments in the world of finance. But you don’t want to take a wrong step. “The economy is in a slump, and things aren’t getting any better,” Shah warned on his latest appearance on FOX Business show Making Money With Charles Payne. With the markets looking weak and tired, Shah predicts an imminent correction and answers the question on everyone’s mind: Is now a good time to invest? To find out how to play the impending market crash – and how triggers like China, a Fed interest hike and gold are a part of it all – watch the video below. Is the Market Hype Becoming Reality? Shah says the “new economy” is here – and you can already see the space growing between the winners and losers. Walt Disney Co. (NYSE: DIS), Tesla Motors Inc. (Nasdaq: TSLA) and Fitbit Inc. (NYSE: FIT) are taking it on the chin. And Netflix Inc. (Nasdaq: NFLX), Uber and Airbnb are on the rise. In other words, a new order is in town. 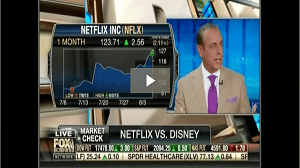 During his latest sit-down with Making Money host Charles Payne, Shah reveals which companies are crumbling and which are crucial for your nest egg. To see Shah’s latest appearance on Fox Business, just watch the video below.